Before entering the educational system, I could read English and Hindi, thanks to my mother. The only thing I remember from this (my first) school is the following incident. The teaching was in Hindi. Whenever a teacher asked a question, many hands were raised and they all said, mai.n bataa_uu.N jii? In Panjabi, bataa_uu.N means brinjal or eggplant. So, to me the statement came out as, I am an eggplant, Sir? I always thought it was funny, always laughed and always got thrown out of class. Many of my classmates were refugees from the Jhang-Maghiana area of Pakistan, i.e. jhaangiis. When the refugees showed up, we typically made fun of them. They would do anything to make a buck. I remember one, who used to yell,"aanaa hik te kele chaar", selling bananas at the rate of four for one aanaa (1/16 of a Rupee). He did not care as long as we bought bananas! In fact, these jhaangiis were extremely smart and settled down rather quickly in East Panjab. Just compare them with the poor refugees who came from East Bengal or the infamous UPwallas in Pakistan. I will soon get back to the Nobel Laureates; just one more story. In a gathering of scientists in Bombay, everybody was making fun of Panjabis and Sikhs, in particular. I, being a "true" Sikh, joined in the fun, as usual. Then a high quality Brahmin from Hardoi, UP, wondered aloud, "Whom do Sikhs make fun of when they gather?" I immediately said, bhaiyaas, UP bhaiyaas. Shuklajii is a dear friend of mine and he did not mind. I told him later that I was ready for any victim. If a Bengali would have asked the same question, I would have said Bengalis without hesitation. Coming back to jhaangiis, did you know that there are 2 jhaangii Nobel Laureates? 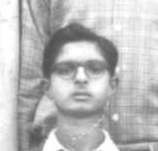 Abdus Salam and Hargobind Khorana. I am proud to have been born (in Daskaa) within 100 miles of the birth-places of three Nobel Prize winners. The third one is, of course, my hero, Chandra. Most of my friends went to the school run by the Municipal Corporation. I went here because my father and his two brothers had gone there. There was one teacher, paNDit raadhaa kishan, who had taught all three of them and then taught me! We used to have fun Fridays in which people sang filmi songs. One is stuck in my mind, ai dil mujhe bataa de tuu kis pe aa gayaa hai. The earliest memories are songs from aavaaraa, barasaat, malhaar, ba.Dii bahan etc. This was a city school and all the village boys like me were put in Section B, whereas all the city boys, supposedly smarter, were put in Section A. Another interesting thing. Section A learnt Hindi first and then Panjabi (from grade 3) and then English (from grade 6). We were taught Panjabi first, then Hindi and then English. Of course, I always obtained the highest marks in my Section and was almost as good as the guys in Section A. By the end of 5th grade, I could read and write Hindi, Panjabi and English quite well. Our house was full of books on every imaginable subject. I read all of them from cover to cover, including the copyright notices and publication information! My father used to subscribe to Sangeet, a magazine devoted to articles and news, published by kaakaa haatharasii (prabhulaal garg). He also subscribed to (now defunct) "Dharamayug". Devoured it. My uncle used to get an Urdu magazine called "Khilona", published by Idriis Dehalavii, the shama-shushmaa publications guy. In order to read that, I learnt Urdu. Couple of incidents remain stuck in memory. In one lengthy but not difficult mathematics problem involving simple and compound interests over varying periods, the answer in the back of the book did not agree with what I had obtained. I tried very hard to find my mistake. Finally, I asked the brightest city boy and he calmly declared that the book was wrong! It was a revelation that printed word can be wrong. Skepticism started. Recently, a classmate of mine from the Jain school days, Shri Dhaniram Goyal 'found' me and we renewed our friendship by recalling the old days from 1954-1957. He reminded me the name of this bright fellow, to whom I am forever indebted. His name is Kewal Krishan. In the second incident, I beat all the city boys and everybody else in grade 6 by obtaining the highest marks ever. My village friends took me on their shoulders and carried me all the way back to my village, about 2 miles away. It was just like Hockey or Cricket, I tell you. The classes were too boring. I was far ahead of everybody including the teachers. I got addicted to watching Hindi movies without telling my parents. Where did the money come from? I taught tuitions. How did I get away? Told the teachers I had some work at home. Since I was very dependable, hard-working and class monitor, they never doubted me. When did I see the movies? Watched shows during school hours and returned home along with my fellow students. How did I buy tickets? That was the tough part. The lower stall (no chance of running into known grownups) was very crowded and there was always a lot of dhakka mukkii. I was very frail and thin. So, I found some friends, sons of truck-drivers or other absentee fathers. Neither their parents nor the teachers cared what they did or where they were. I taught them English and Mathematics for free and they bought the tickets in a jiffy by muscling into crowded lines and by forcing their hands into the ticket window! Saw movies like haatim taaii, dil deke dekho, anaa.Dii, milan, dhuul kaa phuul, baaziigar, superman kii vaapasii. Later, when I was married (1978), I told my father that I used to run away from school to see pictures. He said that everybody knew and they did not care. The reason is that I was perhaps the only student anybody had known who would thoroughly study every single course book and solve every single mathematics problem before the beginning of the school year without any help from anybody! Yes, I was one of those.